If you want to really learn about a state, have someone from that state give you a tour. That is just what Pat Richardson (and her co-chair Connie Huff) did for NFPW members visiting Alaska this fall. Pat was instrumental in putting together the pre-conference and post-conference tours of Alaska. It was great learning about Alaska from a insider’s view. They added that extra knowledge and insider connection that most visitors do not receive. She did an excellent job. She is another unique and unbelievable NFPW member I am honored to call a friend. 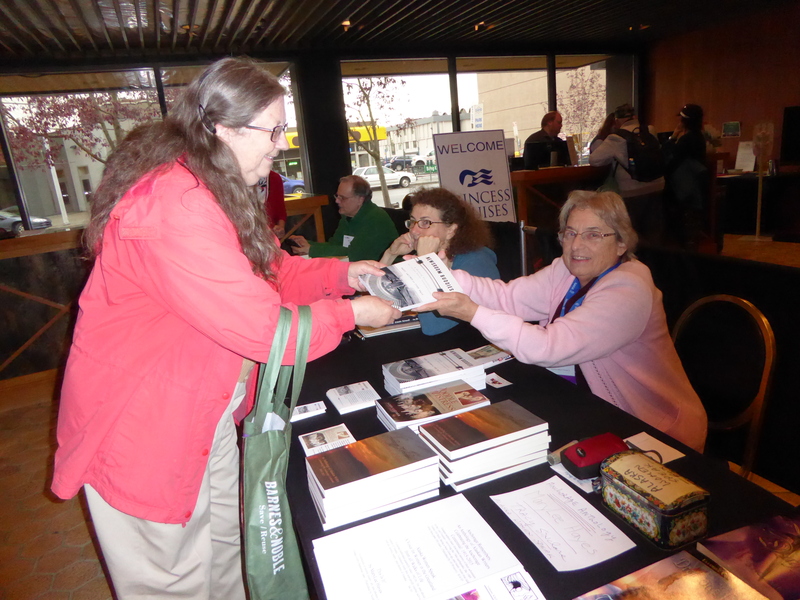 Pat Richardson, left, purchases a book from Sandi Latimer at the NFPW conference in Alaska. Alaska Professional Communicators. I held almost every elected office in the distant past but the appointed position that I love and have held for many, many years is that of historian/archivist. When I worked for the federal government, I had a sign over my desk that read: “Packrats Preserve History”. When I retired, I took it home and it’s somewhere in my house, along with all the Alaska Professional Communicators files and papers I’m preserving. I’m just wrapping up my duties as Alaska conference tours co-chair. Connie Huff, my co-chair, was a big help as my go-to person for advice and guidance. We have been on many NFPW conference tours together and greatly enjoyed them all. APC members Jill Shepherd and Bonnye Matthews helped us with the Fairbanks and Matanuska-Susitna valley parts of the tours. I retired almost three years ago from the U.S. Army Corps of Engineers, Alaska District, where I was a public affairs specialist for 31 years. I got that job based more on experience than education. I doubt you could do that these days. Before that I was an associate editor for Alaska Construction and Oil, an industry magazine. I started out in the production end of the publishing business, where I spent two years on a small daily newspaper in eastern Washington state. I worked my way up from proofreader, to typesetter, to ad and classified paste-up, to page paste-up. I loved pasting up pages; it was like putting together a jigsaw puzzle every day. I could have done that forever (or until computers took over) if it had paid enough to live on. Then, I moved to Seattle where I worked for nine more years in production, starting with a typesetting company that was soon purchased by a publishing company. I finally convinced them to switch me to the editorial side. The publishing company moved me to Alaska in 1977 to take over editorial duties on their Alaskan magazine. That’s when I graduated to a professional level income. Show an interest in any field you want to work in. Keep after it. Network. Be willing to volunteer to demonstrate that you can do the work. While I was in production, I took every opportunity to show an interest in the editorial side of the business. I even went out on my own time to take photos that were needed for a publication and paid to have them processed and printed. I didn’t have the confidence to offer up front. For me, it was more comfortable to show the product than to ask for the work. It took years to make the switch, but during those years, I worked on building my confidence as well as learning the skills. I’d like to be better at keeping plants alive. Is that a talent? It’s probably more a matter of paying attention to them. They don’t get in my face when they need something like my animals do. 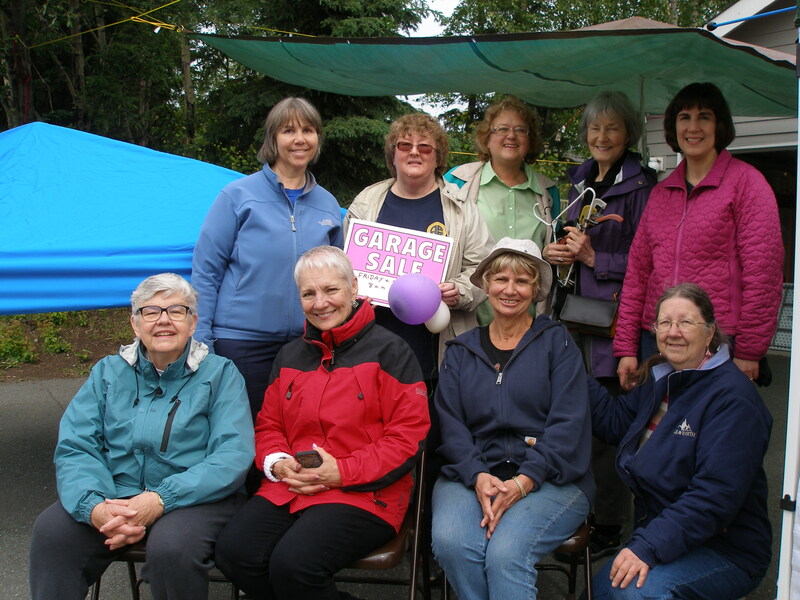 Pat Richardson, bottom right, with some of her Alaska Professional Communicators best friends at a garage sale last summer to raise money for hosting the NFPW conference. I’m happy living where I am in Anchorage but I still have a strong heart connection to the rural valley by the Columbia River where I grew up and where my great-grandparents were among the earliest white settlers. I’ve been working on my family’s genealogy for years. Newsroom Buddies by Sandi Latimer and John Kady about their years working together at UPI news service. I bought it from Sandi at the book sellers table during the Alaska conference. It’s a great book about how co-workers became longtime friends. Also, it brings back memories of having worked for a small town newspaper where one of my first duties was to hang the wire tape on hooks so the typesetters could grab them to run through the Justowriters. Sandi learned to read the code. I never did. I only knew enough to tell where one story ended and another began so I could tear them apart. As a news junkie, I like getting an inside peak at how the wire services work. My friends won’t be surprised by my answer. I love animals. I grew up with all kinds of animals, livestock and pets. We even had pet skunks and a groundhog. However, I don’t recommend keeping wild animals as pets, especially if you keep them in a cage where there is nothing for them to do. It’s cruel. I have two cats (just had to put a third one down) and one elderly blind cocker spaniel. My daughter’s cat is living with me at the moment because her family recently moved from Oregon to Philadelphia. I have an overflowing bookcase packed with books about animals. 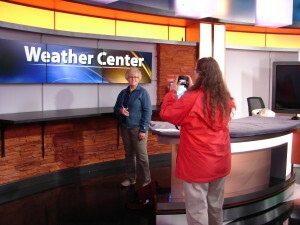 Pat, as usual, is the one taking the photo during this tour in Alaska. In APC and NFPW I’ve found my kindred spirits. Not only have I found my best friends in APC, but I also have learned so much from the members and the organization’s workshops and monthly luncheons. There are a lot of government workers in Alaska. When you are working in a one or two-person writing/editing or public information office surrounded by professionals in other fields who don’t understand why you want to share their work with the public, you need the networking of “your kind” that you find in professional associations. On the national level, I love the people, the conferences and the tours provided by NFPW. I started going to national conferences in 1986, two years after my husband died. When my daughter was young, I took my mother to care for her. They would explore the area while I attended the workshops. We’d go on the tours together. I never would have become acquainted with any other part of the country than the Pacific Northwest if it hadn’t been for NFPW. Now I’ve been to many states and am looking forward to seeing more. I like the educational focus of the tours. They are different than generic sight-seeing tours. You learn about the locals and their places – it’s like reading a nonfiction book rather than fiction. Sorry, I don’t do social media. I have a Facebook page that doesn’t have anything on it. My daughter set it up so I could see her many pictures of my 7-year old grandson, and an occasional photo of her and her husband. I’m all about content, not about the mechanics. Whenever I have something to post on APC’s webpage or Facebook page, I write it and provide the photo but I find someone else in the group to post it. Maybe someday I’ll learn to do it myself, but don’t hold your breath until that happens. This entry was posted on October 14, 2015 at 11:03 AM and is filed under Alaska Professional Communicators, NFPW. You can subscribe via RSS 2.0 feed to this post's comments.